There are reports that Boehner has capitulated in the DHS standoff. Assuming that to be true, I will say this: Republicans whip their people up into a frenzy, plant their flag atop a hill, but when the time comes to batten down the hatches and withstand the storm they are blown away like tatters in the wind. Republicans chose DHS as the place to take a stand. Amazingly, they weren’t prepared to let DHS funding lapse even for a single instant. My advice to Republicans: pick your fights more carefully. Your supporters must be demoralized. 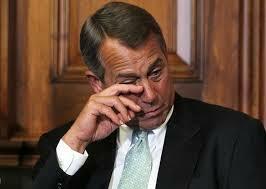 One of the problems for Boehner now is that he’s been caught bluffing several times. Next time we’ll all just say, There goes Boehner again with more of his bluster.